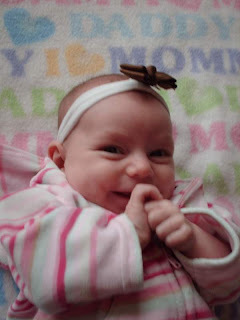 Okay, I promised a while ago that I'd post some cute smiley pictures of Alexia. She actually started smiling really early, but it took us a while to get her to smile for the camera. 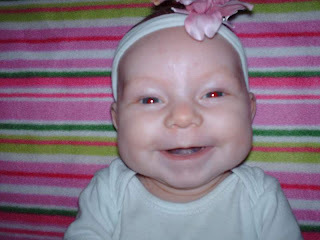 When she first started smiling, it was too fast to get a camera and capture it. 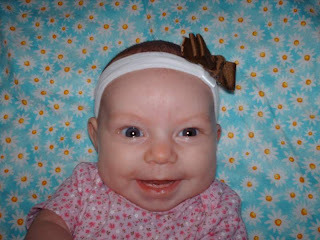 Then, she started smiling a lot, and would hold it for a few seconds, so we finally got some good shots. It's just taken me ages to post them! 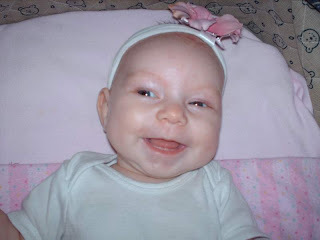 Lexi was really happy one day after a nap, and she just kept smiling and squealing at me. So, I ran and grabbed the camera, thinking the smiling would stop by the time I got back. But, I must have been quick, because here's what was greeting me when I got back. Here's another great one. Looks like she's almost laughing in this picture. Maybe it's not an actual giggle, but definitely a squeal of delight! This one has got to be a favorite of mine. I LOVE this one! I have no idea how I got her to smile so big! And don't you just love her chubby-pinchable cheeks? I'm proud to say, she gets them from me. Everyone says how much Alexia looks like her daddy. But, I think I can claim those chubby cheeks!!! This last one is Jacob's favorite. He took it when we were with my family at a cabin for an overnighter. Don't you just love how mischevious she looks? Like she's giggling at some secret he told her. She definitely loves her daddy! I know it's November, but I finally have my Halloween pictures on the computer, so I can finally show everyone the costumes we used! Halloween is Jacob's 2nd favorite holiday, so we had to do something fun. 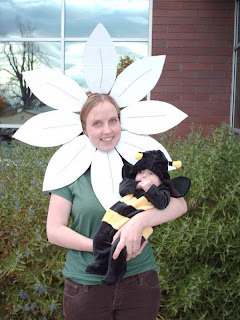 We got creative (mostly Jacob's creative juices) and decided on Alexia and me being a daisy and a bumblebee. Figured it would be a cute theme. Jacob spent a whole afternoon making the ingenious cardboard daisy to fit around my face. We went to Jake's work trick-or-treat, and here's the photo. Cute, huh? I have to say we were pretty cute together. People got a kick out of it. Jacob was dressed as Moroni (golden plates and everything!) But, we didn't get a picture of him. Shame on us!!! I found Alexia's base of her costume at Walmart, and then dressed it up a bit. Jake and I made wings for the back, and sewed them on. 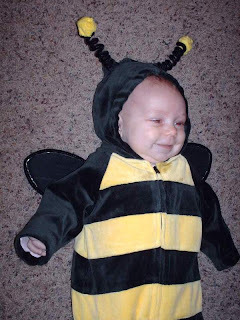 We made the little antennas to put on top, and she was the cutest bumblebee ever! She didn't much like us putting the costume ON her, but once she got it on, I think she realized just how cute she was, and she enjoyed it!!! Now we need a good idea for next year!!! Oh, I’m such a slacker! I still have cute pictures of Alexia to post, but I’ve been caught up in other stuff lately that I haven’t had a chance. 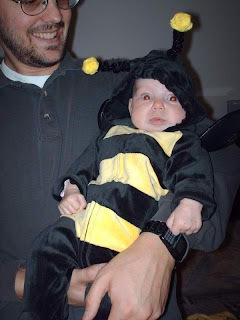 I also need to get some pictures of Halloween posted on here. Will do! But, the election and other stuff has been occupying my brain as of late, and I wanted to post about it. First of all, I’m not shouting for joy that Obama was elected…I was definitely rooting the other way. However, Glenn Beck, a talk-show host made a good point about it. If we go around hating Obama, bad-talking him, and criticizing everything that he does in the next 4 or 8 years, then we are no better than all of the Bush-haters that have gone around blaming him for everything wrong in the country. I got so fed-up with the Bush bashing sessions and criticisms, because although he may have made mistakes, I still respect the guy a ton and hey, he was the president of the United States. Have some respect! So, I'm trying to remember that although I may not agree with him all the time, he’ll still be the president of our country. He will still deserve our respect and need our prayers. Next, I’m saddened by all of the protests and nasty things people have said about the church regarding our involvement in getting Proposition 8 passed. We have every right as a church to get involved and try and spread the word about something we believe in! I cringed when one of the spokespeople for the protests started criticizing “Thomas Monson” and blaming him personally for the passage of the proposition. It actually made me cry hearing him talked about in such a disrespectful way. I know that protesters have rights of speech and can protest when they want to, but it’s hard to see them specifically targeting the church and the temple in California. So, let’s all keep President Monson in our prayers and pray that things can be resolved quickly and without too much negativity towards the church.